This review is about item#33053955. It is transparent and easy to recognize when it is dirty as you can see the inside. Softness was also sufficient, and even if the hose was made long so that the connection work could be done easily, it was able to fit under the sink of the kitchen. This review is about item#33054165. 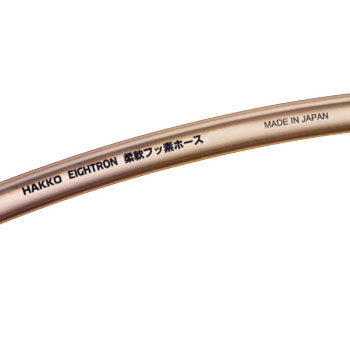 Although it was flexible and tube type hose, it was extremely hard and could not be bent. It was as hard as a copper pipe. I thought that the explanation was inadequate or that it became stiff with long-term inventory items due to secular change. This review is about item#33054095. The hose of the tool which replaces the brake fluid has been damaged by many years of use, so I was looking for a repair tube. In a general PVC fuel hose, flexibility is perfect but there is difficulty in durability of the brake fluid counterpart. So I was thinking about teflon hose, but I was in trouble because the handling was hard so I decided on this "flexible" fluorine hose. Flexible is handling, because it is rather rigid in terms of material, we needed ingenuity to warm up the plug into the mounting adapter. However, it does not get crushed even if negative pressure of suction is applied, so it is very well conditioned. The bleek bleeder tool was quite expensive, so it was saved because we did not replace it. I think that it was also very good that there was sale in units of 1 m.
This review is about item#33054025.